Evening: to the Silver Bullet rock venue in Finsbury Park. I’m here to see Debbie Smith’s band Blindness, playing as part of a benefit for women’s charities, ‘Loud Women’. Entrance is donation only, and there’s a raffle and a table of home-made cakes. Let it not be said that noisy bands cannot provide a good cake stall. Blindness have a textured, gothic and moody sound, a bit like Garbage and Curve (the latter being another of Ms Smith’s groups). I also catch the band on before them, Argonaut, who sound like a classic post-punk indie group with female vocals – a touch of the Raincoats, perhaps. What is rather more up-to-date is a machine in an alcove at back of the venue: a Bitcoin ATM. I try asking people how exactly Bitcoin works (other than being a ‘virtual currency’), but no one around me seems to be in the know. My gut feeling is that it’s the money version of Esperanto: a nice idea but no, really, you go first, I’ll wait and see. As it is, tonight the futuristic Bitcoin machine is out of order. (As I write this, my internet broadband has also broken down. Douglas Adams: ‘technology is the name we give to things that don’t work’). Still, a trio of young men come into the venue at one point, purely to use the ATM, and leave disappointed. And near to the Bitcoin ATM is a poster advertising the services of ‘London’s first Bitcoin-accepting professional photographer’. Raffle prizes at this gig include CDs donated by the bands (I win an Argonaut CD), and books such as Caitlin Moran’s How To Be A Woman, and a collection of Anais Nin’s erotica. I chat with Dawn H, Deb from Linus and Scarlet’s Well (and from Fosca at one point), and Jen Denitto, also of umpteen bands. It’s good to see such faces again. I’m reading some academic texts for the first MA class. The ideas are stimulating enough, but my brain seems to be resisting the dense and sometimes convoluted style of the authors. These are sentences that need a run-up from a distance; sentences that still refuse to give up their meaning after running one’s eyes over them for a fifth time. And there is the anxiety that there is still another fifty pages of this impenetrable stuff to go, and it’s late on a Sunday night, and I’m still not sure I’ve grasped the basic argument. But as I lack the excuse of the novice, the only excuse I can offer is the analogy of starting a car on a frosty morning. I feel I need a few seminars to properly warm up. What I also suspect is going on, though, is a question of taste. After steeping myself in literary prose for four years, I find myself automatically thinking about style, even for a text where all that matters is content. In the Sunday Times bestseller list is a rare appearance of a graphic novel, Username: Evie. In fact, it’s the fastest selling graphic novel in the UK full stop. This turns out to be written by Joe Sugg, one of the young stars of YouTube. His sister is an even bigger star, Zoella. Spin-off books by celebrities are nothing new. What is new is the DIY type of fame that has emerged with video bloggers, where the stars cultivate an audience on the internet directly, without having to go through a more traditional showbiz system of agents, magazines, TV shows and so on. Recently, Mr Sugg’s sister came under fire for using a ghostwriter for her novel, which also broke all kinds of records. A famous person using a ghostwriter is again nothing new – one thinks of Katie Price’s novels. But what fascinated me in the case of Zoella was that she said she had to hire a ghostwriter because books take a lot of time to write. As a YouTuber she was already busy making videos (sometimes on a daily basis), on top of having to write all the comments and tweets that are necessary for sustaining internet stardom. In effect she was too busy being creative online, to be creative offline. Her brother has similarly confessed to using a more experienced co-writer on his graphic novel. I suppose a positive spin on this is that it shows how an invention as ancient as the book can have a role in ultra-modern, digitally-steeped young lives. The blogging fame is not enough: a tactile product is needed too. First proper MA seminar, for the film Beasts of the Southern Wild. The class room is familiar from the BA (Room 124 of Birkbeck’s School of Arts, in Gordon Square), as is the tutor (Anna Hartnell). I also recognise a couple of my fellow students from the BA course. But what’s changed is the atmosphere. There’s a much higher ratio of academically articulate students than there was for the BA. It’s very clear that this is a class of not just students, but high-achieving graduates. To use a suitably contemporary phrase, for an MA on contemporary culture, I have to ‘up my game’. The winner of the BBC National Short Story Award is announced. Jonathan Buckley wins with ‘Briar Road’; Mark Haddon gets the runner-up with ‘Bunny’. My own choices were quite different: I favoured Hilary Mantel’s ‘Assassination of Margaret Thatcher’, with Jeremy Page’s ‘Do it Now, Jump the Table’ as second. I really am baffled by the judges’ choices this time. I wonder if it’s to do with Ms Mantel and Mr Page daring to employ elements of humour, and the judges mistaking humour for relative lightness. I think the opposite: humour adds depth. The photographer Philip Woolway is taking photographs for a feature on the museum. 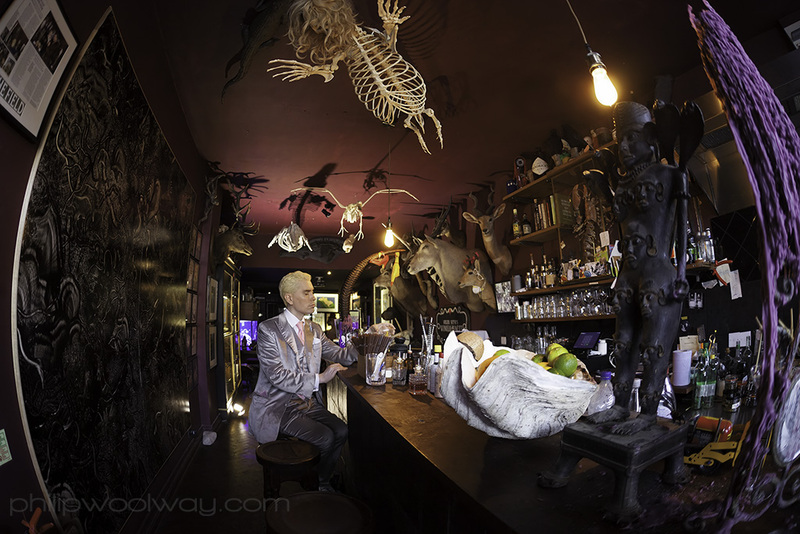 He asks me to pose for a shot of the cocktail bar. Then to the crypt café of St Martin-In-The Fields, near Trafalgar Square, to meet up with my friend Maud Young. Maud is one of the people I sometimes exchange letters and postcards with. This time we see if we can actually arrange a meeting purely via postcards, without recourse to the internet or phones. It takes three or four cards, but we manage it, and here we are today. I wonder, out of all the thousands of meetings set up in London today, if ours is the only one organised via postcard. If nothing else, it has lasting anecdotal value. 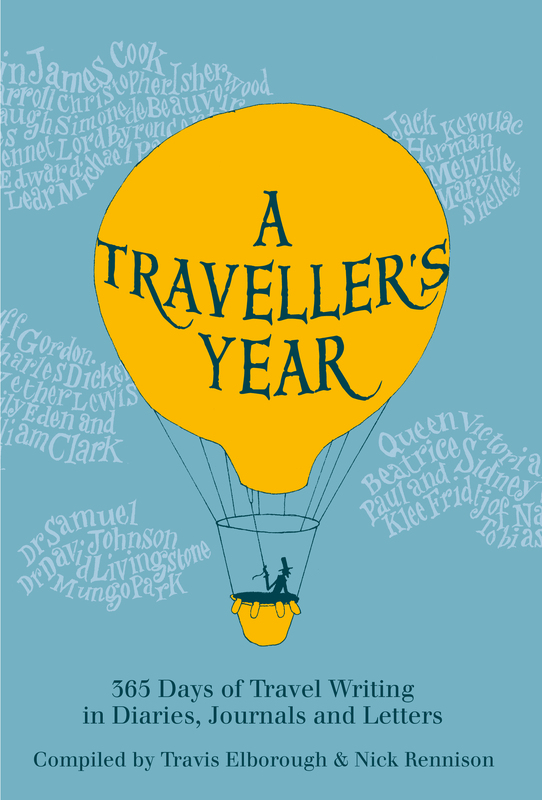 Then to the basement of Stanfords Travel Bookshop, in Long Acre, Covent Garden, for the launch of A Traveller’s Year. This is a new anthology of diary entries on the theme of travel, edited by Travis Elborough and Nick Rennison. There are extracts from my blog in there, covering trips to Brighton, Tangier, Bruges, New York, Sweden and The Hague, and then one on taking forever to get from Harwich back to London, on a day of replacement rail services. It’s a reminder how a lot of travel is carried out in a spirit of undiluted irritation, and even murderous rage. As anyone who has tried to take a train in Britain on a Sunday will tell you, sometimes travel narrows the mind. I read the Brighton extract read aloud tonight, for the crowd. Also say hello to Emily Bick, Andrew Martin, Cathi Unsworth, Karen McLeod, and Guy Sangster Adams. Then off for drinks at the French House in Soho, where we’re joined by Shanthi S and her friend Helen, finishing with a late meal at Café Boheme on Old Compton Street. At which point I am visibly wilting and dash off to catch a late tube home. Something of a hangover, thanks to the large amounts of free drink at three different locations on Wednesday (the Wynd museum bar, the book launch, the French House). Despite this I stagger off to a private view all the same, this time at the Stash Gallery, in Vout-O-Reenee’s. The show is called ‘held’, by Jane Fradgley, and comprises many black and white photographs of Victorian straitjackets, spookily shot again black backgrounds for a ghostly effect. The collar label of one is clearly identified as ‘Bethlem Hospital’. If it were not for the sinister straps at the end of the sleeves, some of the garments look quite pretty. To the East Finchley Phoenix to see the new film version of Macbeth, starring Michael Fassbender and Marion Cotillard. It’s a gritty and intense rendition, dominated by outdoor locations. Lots of battle scenes, smoke, mud, and (naturally) blood. Some nice medieval make-up and costumes, when they’re not covered in mud. There’s a number of interesting choices taken with the text, though the cutting of the ‘toil and trouble’ speech by the witches is quite common these days, particularly as the supernatural details are thought to be added by Thomas Middleton. What is original in this film is visions of dead children as justification for the whole plot – either visions of Macbeth’s own offspring, or boy soldiers whom he feels responsible for. The dagger he sees before him is actually held by a ghostly boy, while Lady M’s ‘damned spot’ is not a vision of indelible blood on her hands, but spots of disease (or possibly burns) on the face of a dead child. On leaving the cinema, I overhear a group of middle-aged women in front of me. ‘I think we’ll choose something cheerier next time’, says one. As if they were expecting Macbeth to be a light-hearted romp.